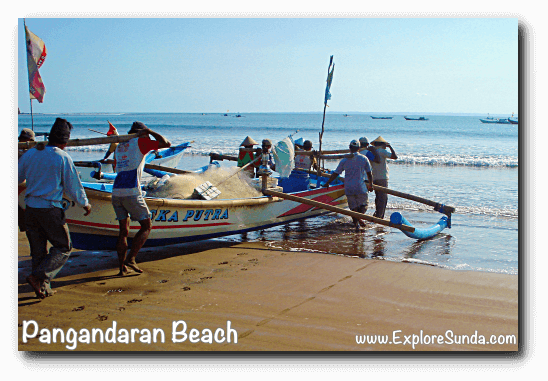 For many years Pangandaran is the most favorite beach in the land of Sunda. 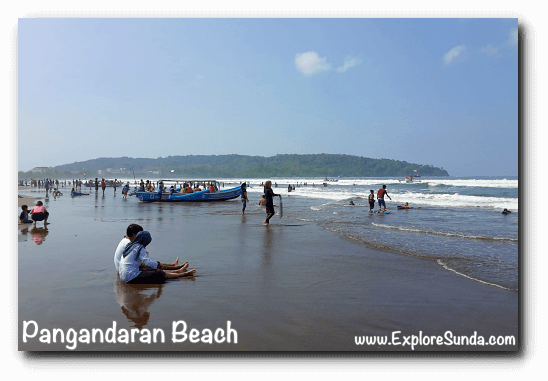 Despite of its remoteness, many people love to visit this beach. So, what's so special with this beach? 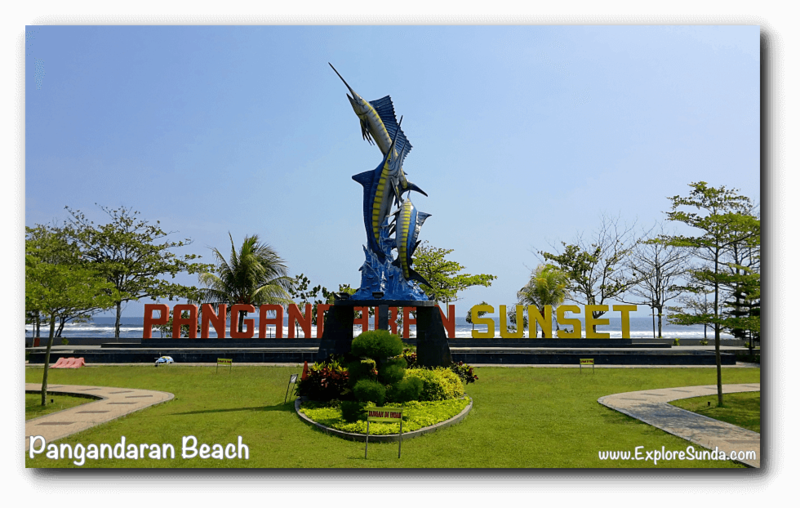 Pangandaran is an exceptional beach because it is located very near to a peninsula, while the whole peninsula is used for Pananjung Nature Reserve. Thus, the waves and currents here are not as strong as other beaches in the south of Java island, but not as weak as in the north or west of Java. The closer we get to the nature reserve, the calmer the waves. This beach is special because the whole beach is a public beach. There isn't any single property owns a private beach here. A two lanes road separates the beach from the hotels. There are two sides of the beach, especially near the peninsula, the west and east side. Interestingly, in the morning we only need to take a short walk to east coast to watch the sunrise and in the afternoon we walk to west coast to watch the sunset. The distance between east and west coast near the peninsula is less than 500 meters! Between the two, the favorite is the west beach because it is wide. The sandy beach is more than 50 meters from the side of the road to the shoreline. Since the area near the road is covered with plenty of trees, the shady areas are utilized by various vendors selling and renting their merchandises. 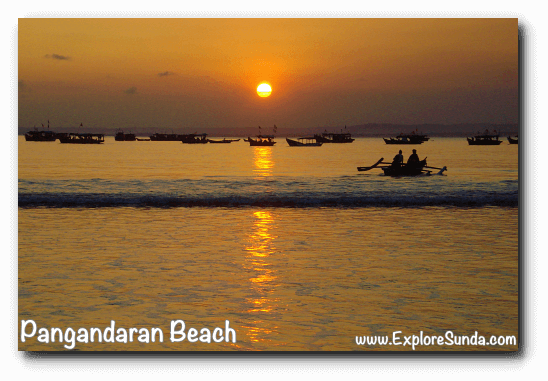 Rent a fisherman boat and go to Pasir Putih (white sandy beach in English) located in Pananjung Nature Reserve. It is more fun than walking through the nature reserve to reach it. 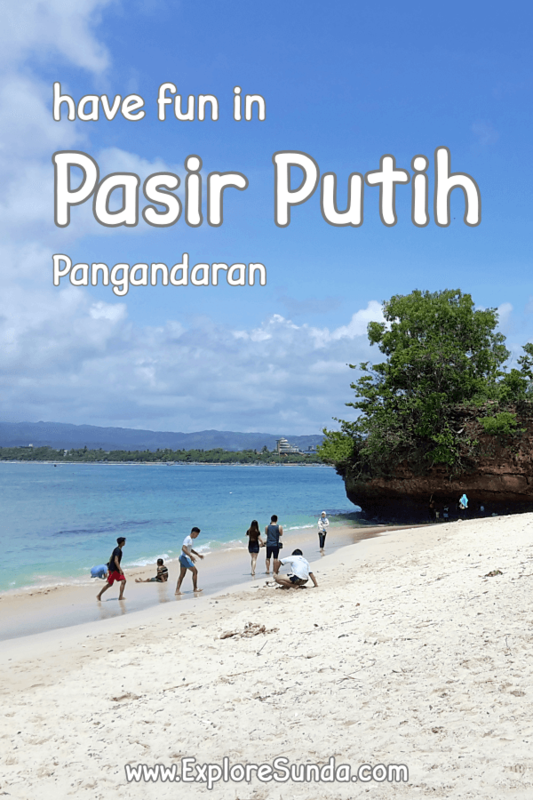 Pasir Putih is famous for its white sandy beach and it has a beautiful spot for snorkeling. Rent boogie boards. You can see many of these boards on the beach. They are the favorites because the rent is not expensive at all, between Rp. 10,000-15,000 each and they are fun for riding the waves near the shoreline. 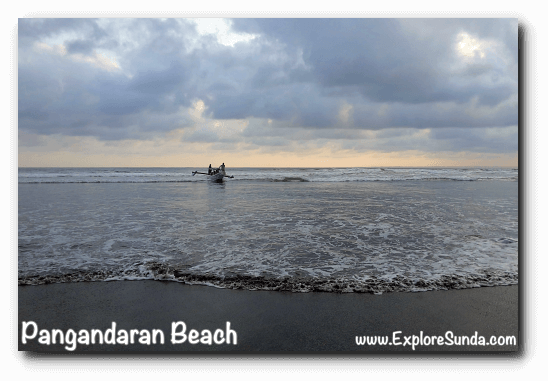 Since Pangandaran is facing the south ocean, the waves are suitable for surfing. If you want to learn how to surf, there is private lessons you can take. 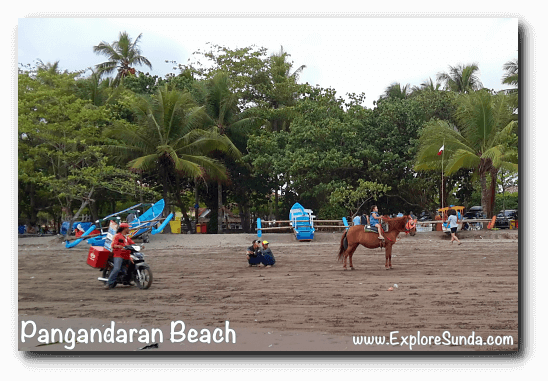 Ride a horse along the beach or hire a mini delman (a traditional horse cart). Rent a battery-operated motorcycle. We can ride them on the beach. All Terrain Vehicle (ATV), which can carry 2 to 3 people. The trending one is cycling an old Volkswagen. They use the upper body of a VW beetle, without any door and window. It fits for 4 people who will do the cycling to replace the engine and 1 person as the driver. It reminds me of the classic cartoon: The Flintstones :) It is more exciting to cycle them at night since the temperature has dropped a bit and the car is gorgeous with all of its lights turned on. 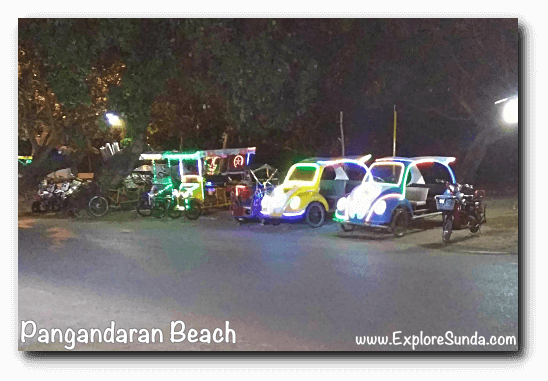 Hire a becak (a three wheel cart, where the passengers seat at the front and the driver pedal on the back) to explore the surrounding area of the beach. Being on the beach is fun but let's face it: it could be very warm. So it's such a relieve whenever the ice cream sellers are passing by on their bicycles :) Sometimes meatball vendors also pass by. Some people love to play volley beach and soccer on the beach. Perhaps you'd like to join them? You also will notice there are plenty of traditional boats come and go in this beach. 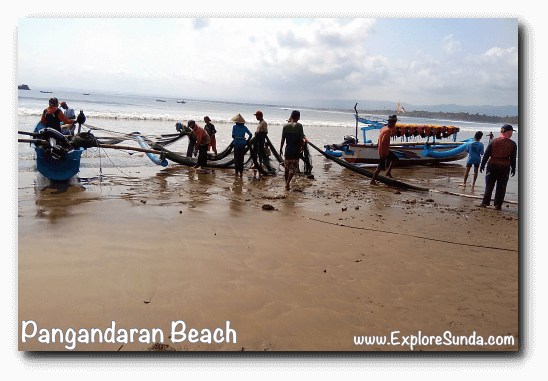 Many sail back and forth carrying guests to Pasir Putih while some carry a wide fish net, throw it to the sea a bit far from the shore, then their friends on the beach pull the net back to the beach hoping many fishes caught inside the net. Fishermen used to lift their boat from the dry shore to the sea, but now they use 2 wheels so the job can be accomplished with only 2-3 men. Now you can imagine how busy is this beach, especially on weekends. So, please be cautious, make sure no vehicle, boat, horse, or ball collide with you while you are having fun. Also, please listen to the lifeguard. They patrol the beach from 6am to 5pm everyday and they keep warning us whether the ocean is safe for swimming during that time. Make sure you avoid part of the beach with red flags on it, because it is a dangerous area due to the strong currents. How about the east beach? The east side doesn't have sandy beach and it is not suitable for swimming. But you can play Jet Ski, Banana boat and Donut here. 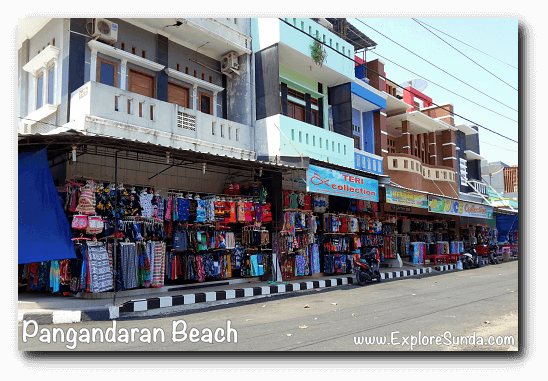 The most sought after souvenirs from Pangandaran is the beach clothing including t-shirts. 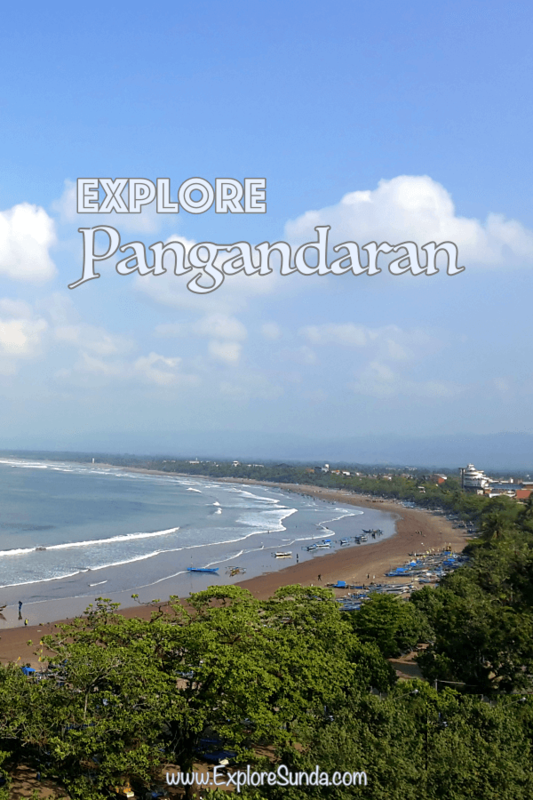 They are all creatively crafted with Pangandaran in mind. Tourists also like to go shopping for salty fishes. Since they are all products of home industries, there is still no standardized quality control. Hence, it is a gambling to find the tasty ones according to our taste. Whenever we go to a beach, some people love to do shell hunting. We won't find any shell on this beach though. Due to its strong current, any shell washes out to the shore will be broken to tiny pieces. So, you just need to move your shell hunting from the beach to the shop :) Some shops sell these lovely shells, they are all already cleaned and polished. Usually the small shells are assembled to create souvenirs such as paper weight and accessories. However, please make sure you bring sufficient cash. Although EDC machines for debit and credit cards are available in some shops and restaurants, often they can't be used due to the network problem. If you need more cash, there are some ATM available, two are located beside Laut Biru resort. Alternatively, if you are a BCA debit card holder, you can go to mini market such as Indomaret and draw cash from the cashier. Hire a boat to cruise Cijulang river. We will pass through a beautiful canyon. They are all green here: from the color of the river to the trees above. Don't miss this one of a kind experience. 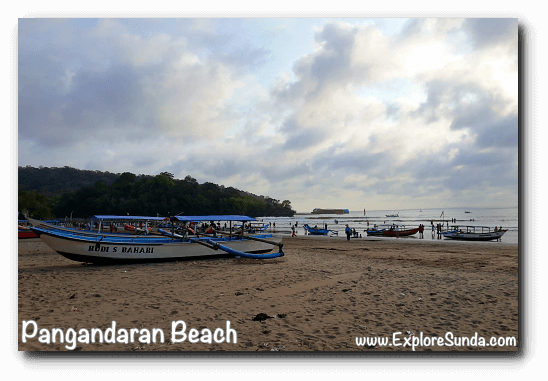 In recent years Batu Karas beach gains its popularity, especially among the surfers. Hence, we don't have to worry about accommodations anymore. There are plenty of accommodations there, ranges from youth hostels, guest houses to the various stars of hotels. Due to its strong current of the south ocean, there are many unusual shape of rocks in the neighborhood. There are many big rocks protrude in the sea and we can see them from the cliff. The local people named the rocks based on their shape. The popular one is Batu Hiu (Shark Stone). 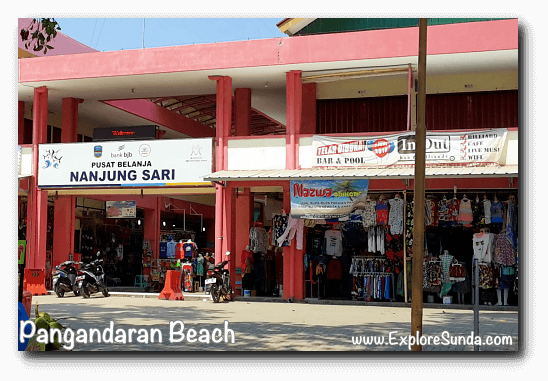 Unfortunately, the ticket is as expensive as ticket to Pangandaran beach, although we spend much shorter time here. 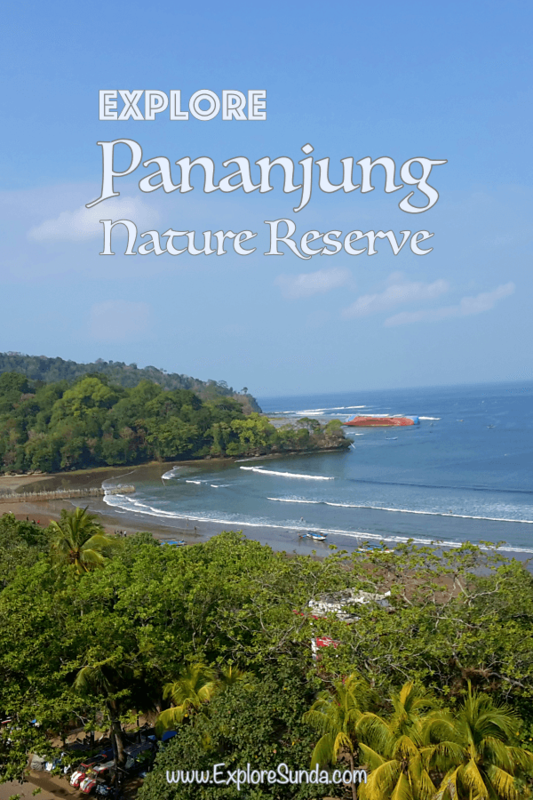 At the end of this peninsula lays a nature reserve called Pananjung, habitats for bull, deer, and monkeys. We could take a guided tour to the bull feeding place, but don’t expect too much. Often the bulls do not want to come there, perhaps they are too afraid to see human. 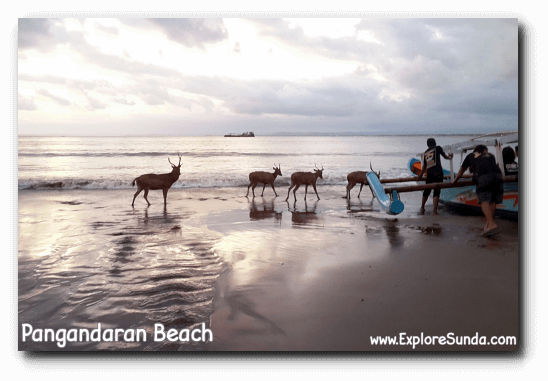 On the other hand, it is easy to find deer and monkeys on the beach, outside of the nature reserve. People are already used to them, so they don’t disturb each other. However, please be careful when you are eating some snacks near the monkeys, because they often grab it. It’s because many visitors feed them with whatever food they bring, hence, whenever the monkeys are hungry they get out of the forest and try to find some leftover on the beach or find some human to feed them. There is a white sandy beach called 'pasir putih' inside Pananjung nature reserve. The sands are white and soft. It is a favorite place for snorkeling. There are two ways to go there. First, we walk through the forest. 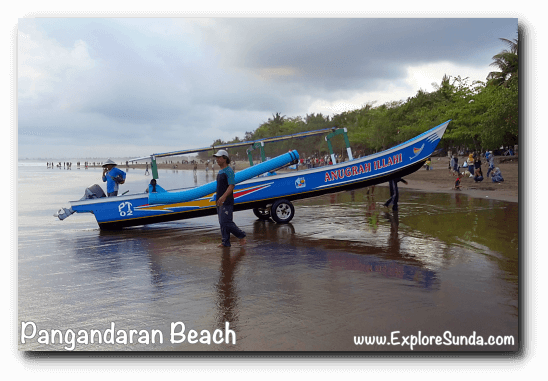 Alternatively, we rent a boat and sail to pasir putih beach. 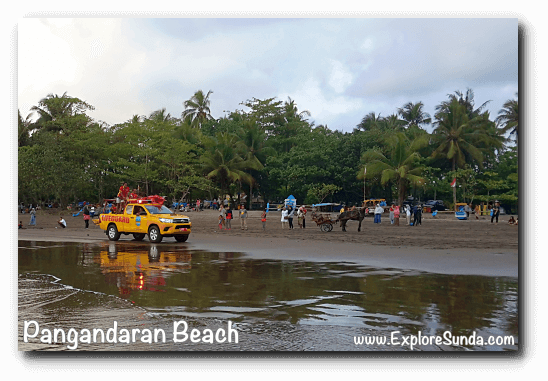 Last but not least, if you visit Pangandaran around July, you might be able to see or even participate in the annual kite festival. It is a famous festival that are many people are eager to see, so you need to be well prepared in terms of accommodation and means to get there. 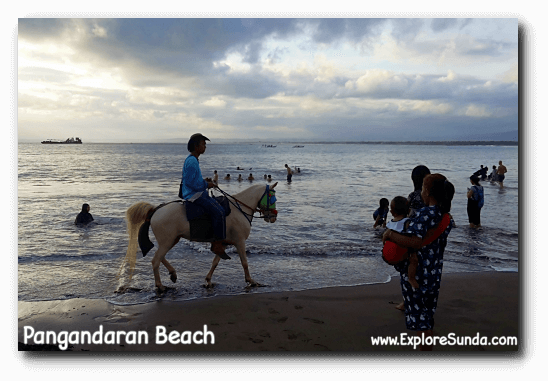 How do we know we have arrived in Pangandaran? That's when we reach a welcome gate complete with the ticket booth. We must pay the entrance ticket, which is valid for the duration of our stay, so please keep it safely. One bizarre thing in the ticketing system here is that we pay the ticket based on the vehicle we used. If you arrive on foot or using public transportation, then you only pay the personal ticket. But if you drive here, the bigger your vehicle, the more expensive you will pay, regardless of the number of passengers in the vehicle. It seems they just assume any vehicle will be used to its maximum capacity. 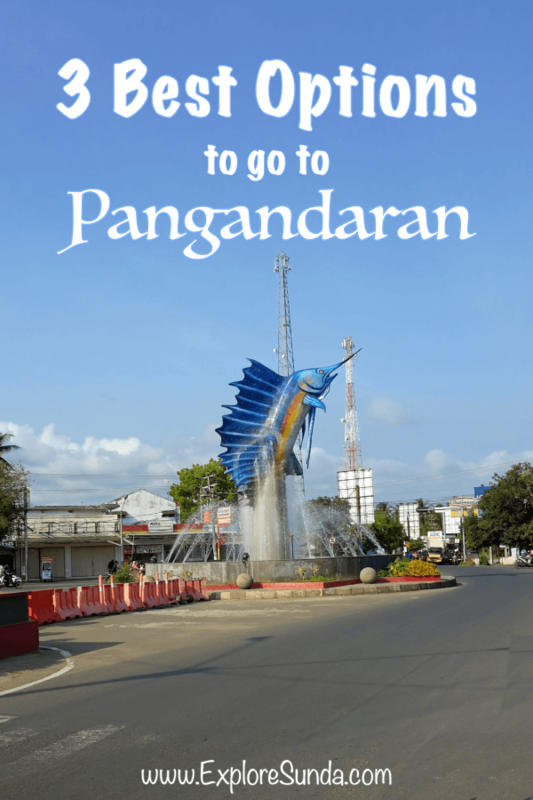 How do you prefer to go to Pangandaran: by car, train or plane? 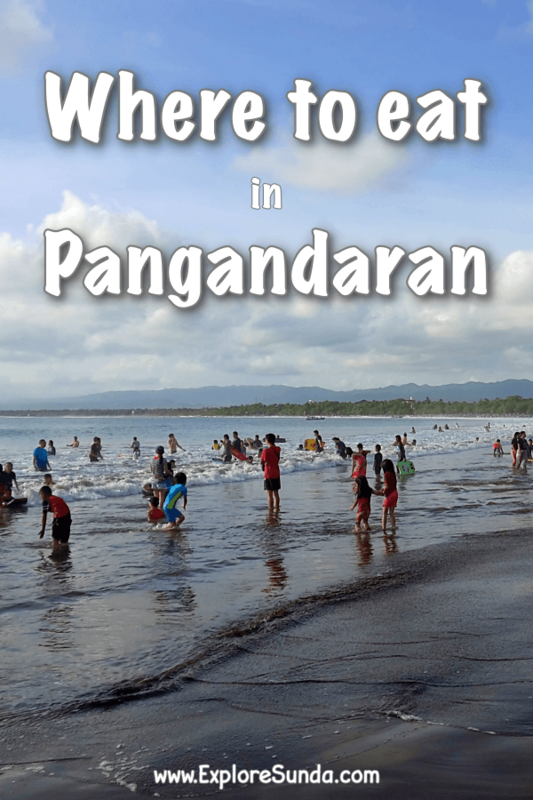 Where to eat in Pangandaran? 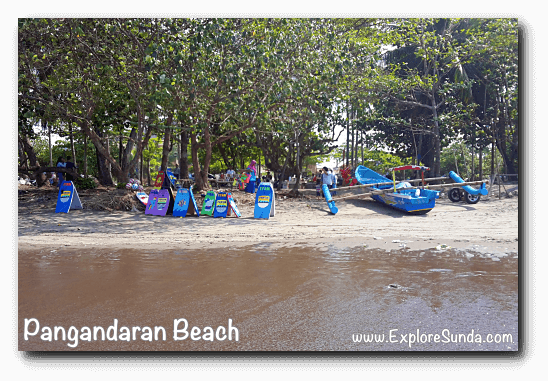 Being in the seaside, fresh seafood is always the most sought after food in Pangandaran. But, what if you are allergic to seafood or simply don't like it? Here we provide you with a list of eateries nearby, where some serve seafood and others serve non-seafood. 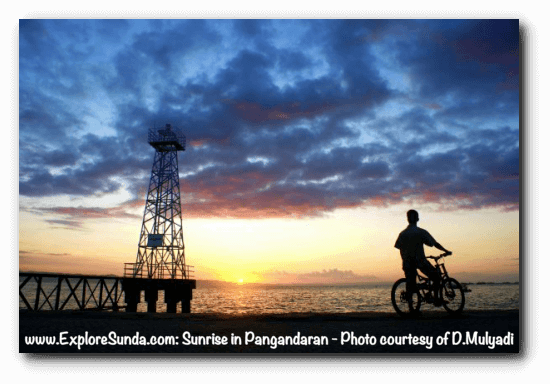 Three sides of Sunda is surrounded by the sea, so there are plenty of beaches we can explore, each has its own beauty and uniqueness. Which one is your favorite?